Sham and I left Singapore to take up residence here in New York almost ten years ago to this day. And today it felt like I was back in South East Asia. The 77F and 85% humidity at the 8am start, possibly the worst conditions of all my NYRR races from 2005-2014, were almost as high as what I used to contend with every day one degree north of the Equator. By the time the starter’s gun went off I was more than warmed up. My Warren Street running vest was a darker blue. Sham and I had run from Marcus Garvey Park in central Harlem where we’d parked the car (we usually ride Metro North to Harlem 125th Street or Grand Central Terminal and then run to the start but train times were unfavorable this time so Sham drove us in). A bit of pre-race banter. The opening mile took us up Cat Hill. I started out faster than my last race and passing the one mile mark in 5:02 confirmed it was perhaps too fast. 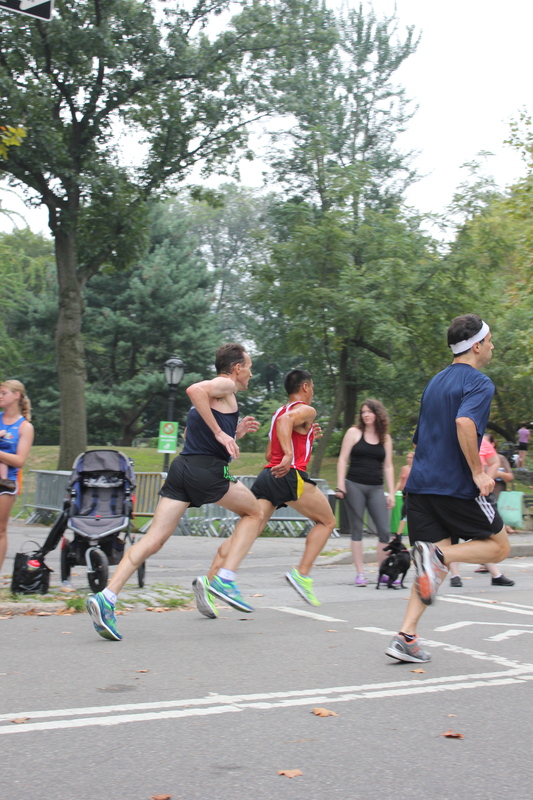 I was trading strides with Roberto Puente of West Side Runners (he went on to edge me at the finish). I adjusted my pace (aka slowed down) on seeing the clock. The second mile of this race is fast. It takes in the long flat straight by Engineer’s Gate, descends from 94th St. through 98th St., flattens out and then descends the first half of the 102nd St. Transverse. The clock at 2 miles read 10:13. I was on track for running around 20:45, a 90% age graded performance and under my projected 21:00, but feared mile 3 could be my undoing. It would be. The third mile, heading south down the West Drive, takes in a few small inclines and a long steady incline approaching the reservoir. That long incline is ‘disguised’ as it slowly swings to the west. By now my body was seriously complaining. A few runners sailed passed me including Matthew Lacey. Passing 3 miles in 15:43 left me needing to run mile 4 in sub-5:20 to squeak under 21:00. It was not to be. That final mile was one to survive and then forget. While mainly downhill I was laboring much of the way. The only comfort was knowing that another 5,000 plus runners were in the same boat. A pain shared is a pain halved. On the small rise up to the finish the clock came into view and was already reading 21 something. The results had me at 21:11 (23rd place, 1st masters and 2nd men’s AG with 89.56%). My Garmin disagreed: it read 20:57. Did I veer off course somewhere? Either way a PW, my slowest 4 mile race ever! Almost at the finish – finally. This one hurt more than most. I was bent double on the finish line for a few seconds. Screaming volunteers urging me to move got me mobilized. I waited in the finish area to see in team members. 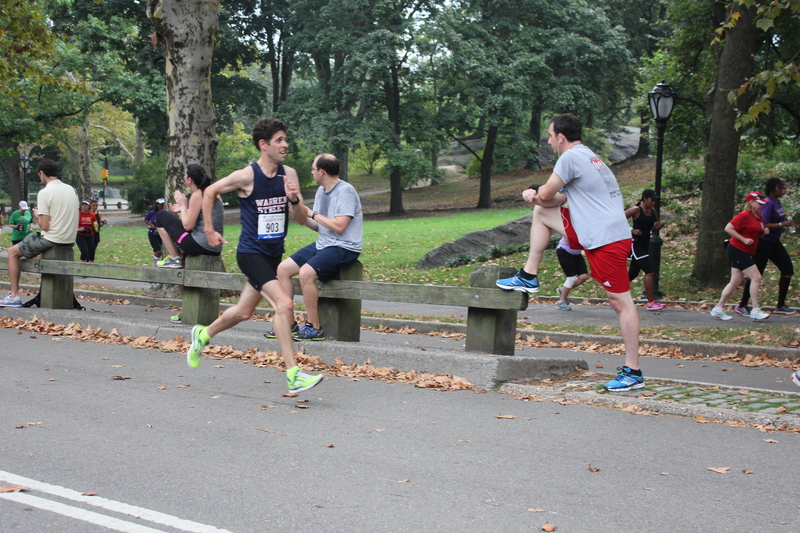 Sebastien B, Aaron Mendelsohn, Ryan Korby, Danny Tateo and I made up Warren Street’s 5th place open men’s team while Aaron, Danny and I won the masters, beating CPTC and closing down their lead to a few points in the 2014 NYRR club standings. Aaron looking strong at the finish in spite of the heat. For a few moments I wondered the sense in it all. I was exhausted, soaked in sweat, and had gotten up at 5:30am. But idle small talk with team mates and rivals soon reminded me why. 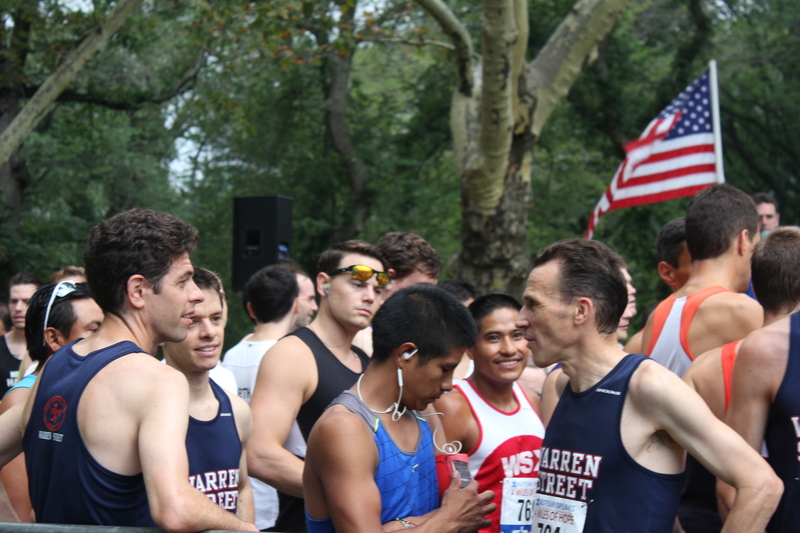 It’s about being part of New York’s great running community, in particular team mates and fellow masters runners. I hope they, like me, are getting in some well earned rest this afternoon. In an ice bath. 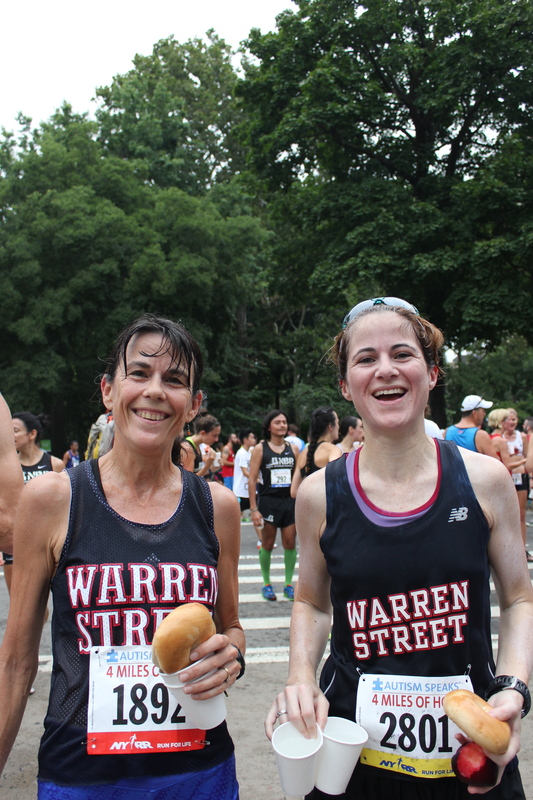 Warren Street women runners were still smiling post-race.